Despite Voracek's questionable hit on Boychuk earlier this month - the one that earned him a two-game suspension, and had Boychuk leaving the ice gesturing in anger - the two didn't tussle. PHILADELPHIA — It sounded a little bit like coach- speak when Barry Trotz said it before the game: Johnny Boychuk wasn’t going to be focused on Jakub Voracek, not when there were two points on the line. 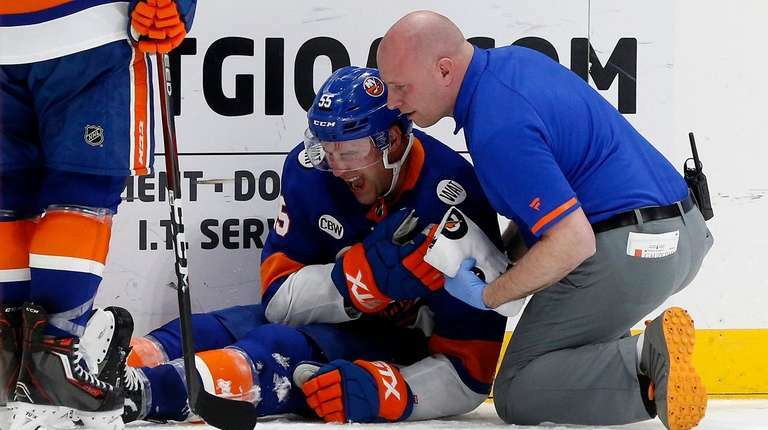 Despite Voracek’s questionable hit on Boychuk earlier this month — the one that earned him a two-game suspension and had Boychuk leaving the ice gesturing in anger — the two didn’t tussle in the Wells Fargo rematch Saturday. That was the case, Boychuk said, simply because there was too much on the line. Afterward, Trotz lauded Boychuk, who missed one game after being leveled by Voracek and was a healthy scratch for five games after that. Still, he hinted that all was not resolved between the two. Despite having some strong words for his team’s effort against Montreal on Thursday, Trotz kept all his forwards as is, with only a change to the first defensive pairing (Boychuk for Thomas Hickey).